Hwange is a huge slice of the north western Zimbabwe's territory on the border with Botswana. Covering a area of about 14,600 sq.km. Hwange National Park boasts more than 100 different animal species and over 400 species of birds. With up to 30000 elephants, Hwange is one of the few great elephant sanctuaries left in Africa. A 480 Km. game viewing roads network, leads to outstanding animal concentration points and waterholes. 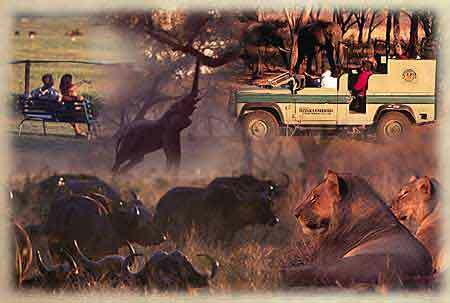 Safari Package offering 2 nights at Hwange Safari Lodge full board basis, scheduled activities as offered by the lodge, park entry fees, scheduled transfer from/to Victoria Falls. Safari package offering 2 nights at Sable Valley Lodge full board basis, scheduled activities as offered by the lodge, park entry fees, scheduled transfer from/to Victoria Falls. Last revised: December 19, 2004.